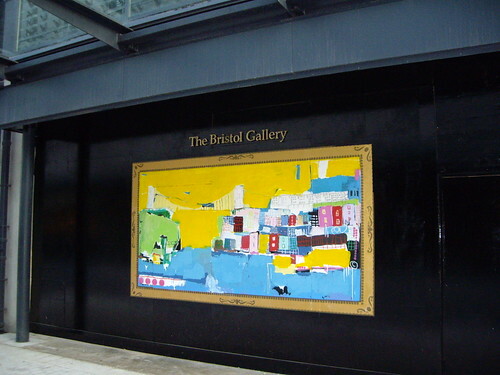 The Bristol Gallery, originally uploaded by still awake. The painting appears to be a clumsy but bright depiction of the Clifton Suspension Bridge over the Avon and the surrounding houses in Clifton. It rests on the wall opposite the Bristol Gallery and I find it extremely unpleasant. I don’t like it but I hesitate to say so because I keep thinking it might be a gift from some pre-school kids who put their little hearts and souls into it. The gallery is situated at the Millennium Promenade, Harbourside, Bristol. Can anyone shed any light on the purpose of this work of art?